On-demand cross-flow 4 wheel drive system, 2 wheel drive in transport mode. Direct coupled variable displacement pump. 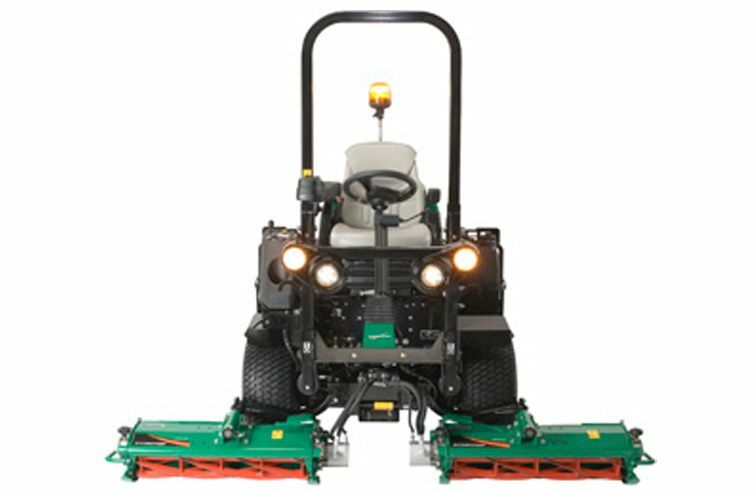 The Highway 3 features the most advanced control systems yet seen in a Ransomes mower, perhaps any commercial mower and, because of this, many of the traditional gauges have been replaced with a single, multi-functional screen. The instrument panel contains switches that operate the parking brake, starter key, cutting unit engagement, backlap/mower reverse and hazard warning lights, if fitted. This provides all the information required for safe operation including: warning lights, fuel gauge, hour meter,subsequent displays contain information on oil and water temperatures, oil pressure, blocked filters and various other warnings. When a service is due an indicator displays the time left before the service and provides a list of the service items and parts required to complete the job. Any faults will be logged and can be retrieved later. The tried and tested Sport 200 cutting units are now 6.6lbs lighter per unit, but still maintain their strength, durability and reliability. A robust swing out unit that can withstand the rigours of commercial operation. It is strong and durable, while providing easy access for servicing and major annual maintenance. The tried and tested Sport 200 cutting units are now 3 kg lighter per unit, but still maintain their strength, durability and reliability.